The RICO layout is certainly creating a buzz. It has been used on Tour successfully this season including by Parker Bohn in his win in Spartanburg on the Viper pattern as well as in qualifying by Diandra Asbaty during her march to winning the Great Lakes Classic on the Cheetah pattern. Much discussion is appearing on the message boards, with various amounts of accuracy. So, with the goal of providing accurate information, I went directly to Ric Hamlin, the individual credited for the layout, to get details from him directly. Ric is the Consumer Products Specialist, for the Northwest region, Brunswick Bowling and Billiards. Here is an overview about the RICO layout including when to use the layout, how-to map the bowling ball, how-to alter the layout for a higher track player. I also provide a summary of how the layout was first used and why. This is intended to present a more accurate overview of the RICO for those who want to have a better insight into this useful layout. When to Use the RICO Layout? 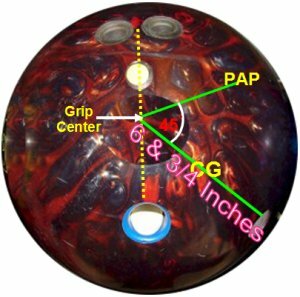 When choosing a bowling ball, make an effort to obtain a ball with a pin distance (PIN to CG) that is close to half the distance of the ring finger span (Ric's recommendation and what he tries to do when using this layout). Top weight should be around 2.5 to 3 oz. In other words, the angle created from the PAP to grip center through CG to weight hole will be 45 degrees. NOTE: The weight hole is extremely important in this layout. In a bowling ball with a symmetrical core, this will create more asymmetry since the weight hole is drilled into the core 90 degrees from the PIN, or 6 ¾”. So, it will increase the dynamics of the reaction. 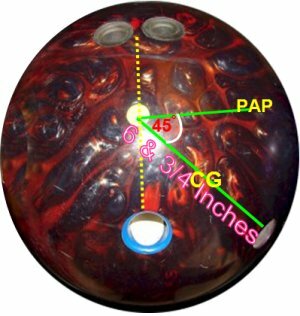 In a bowling ball with an asymmetrical core, the PSA/MB is placed at a 45 degrees from the grip center. The more asymmetrical the core is, the less a weight hole will have an impact on the motion. But, when adding a weight hole, the amount of asymmetry will be increased. Thus, this will increase the overall reaction of the ball. Watch the ball reaction as Parker Bohn III throws it in South Carolina, on TV. Parker is throwing this on the Viper pattern (37 feet). Click here to launch the Youtube video In addition, Brad Angelo used this layout in the Finals of the Windy City Classic. This was bowled on the 44 foot Shark pattern. Click here to see this Youtube video. Notice the smooth ball motion from the oil to the dry. For higher track players, there is a greater chance of the ball hitting the middle finger. Although Parker Bohn (PAP of 5 & 3/4 over and 1/2 to 3/4 up) has no such issue when using this layout. To adjust, move the Pin up on the center line the amount, the distance, of the vertical PAP coordinate. This should raise the bowtie enough to miss the finger. This should alter the layout enough to avoid flaring over the middle finger. This is particularly important for those with a high lateral PAP (5 ½” and above ½” on the vertical). Moreover, to achieve a similar result, you can move the PIN closer to the PAP (more similar to leverage) or away from the PAP (to create more length).